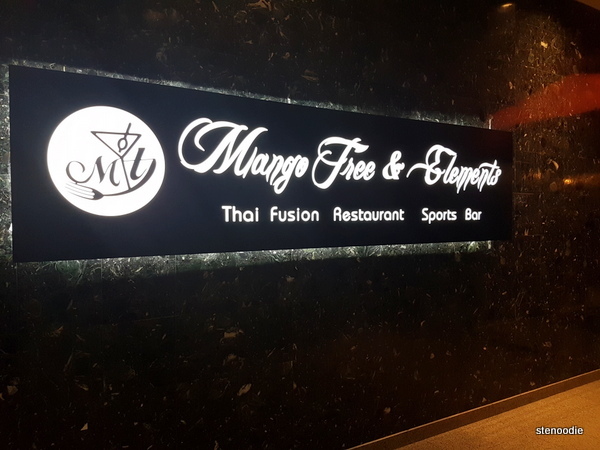 March 15, 2019: We decided to check out this new Thai restaurant in Markham called Mango Tree Thai Fusion Restaurant. 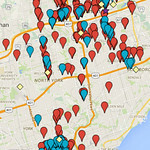 It’s located on the second floor of the building where Take One Karaoke is (along Woodbine Avenue). If you call in to make a reservation, you can get 10% off your bill, which I promptly did upon seeing this deal on their Instagram page. 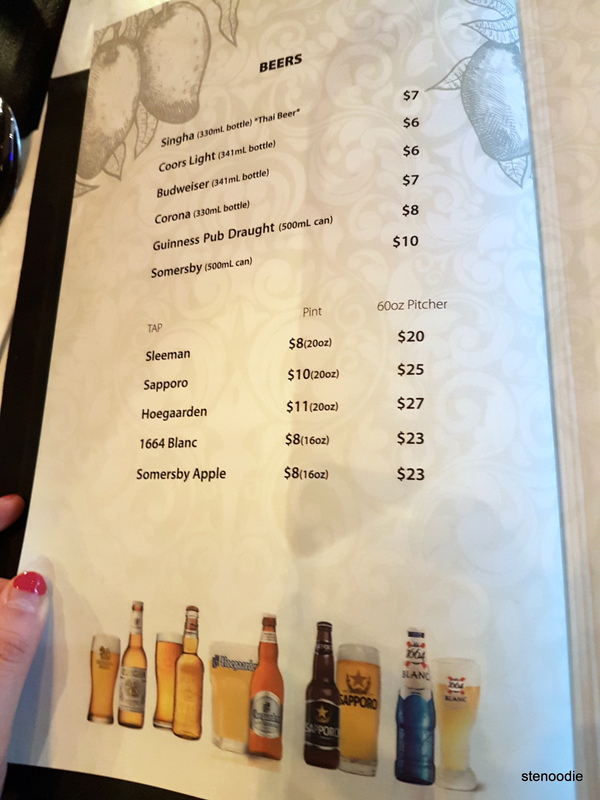 When I arrived at the address, I was confused as to where the actual restaurant was. I knew that it was on the second floor but didn’t see any signs showing any sign of the restaurant (no pun intended). I had to text my friend who told me it was inside of the building where the karaoke was. It wasn’t until I walked to the second doorway of the 7850 Woodbine building that I finally saw a sign for the restaurant. You can either take the stairs or the elevator to get to the second-floor restaurant. The building itself felt dark and shady, especially when you get on the loud-humming elevator. Look at how big this space is! We were only one of two parties there for the majority of the night. 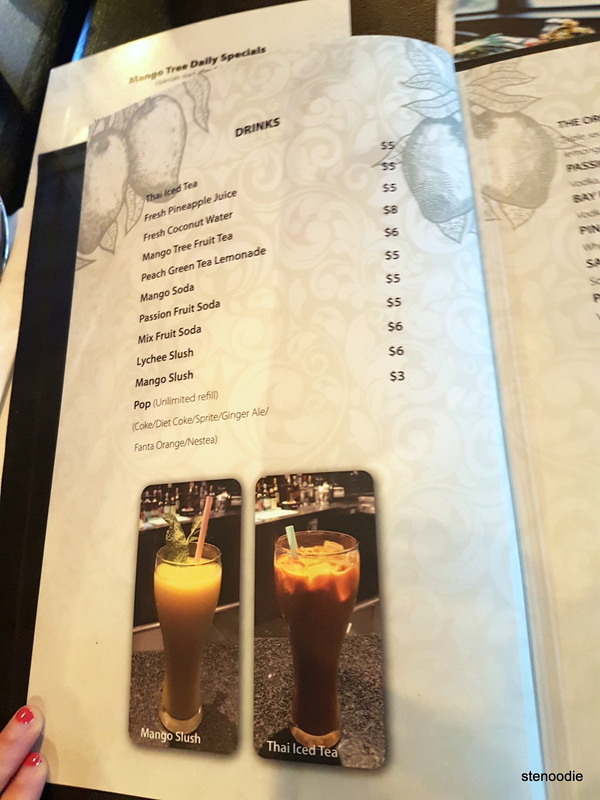 It felt a little eerie to be one of two tables of customers that night on a Friday night, especially so when the space was already so large and airy. 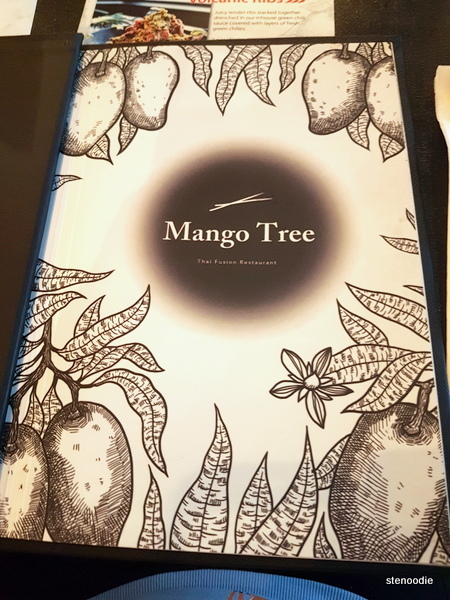 I liked the cover design of the menu featuring some hand drawn mangoes on branches. 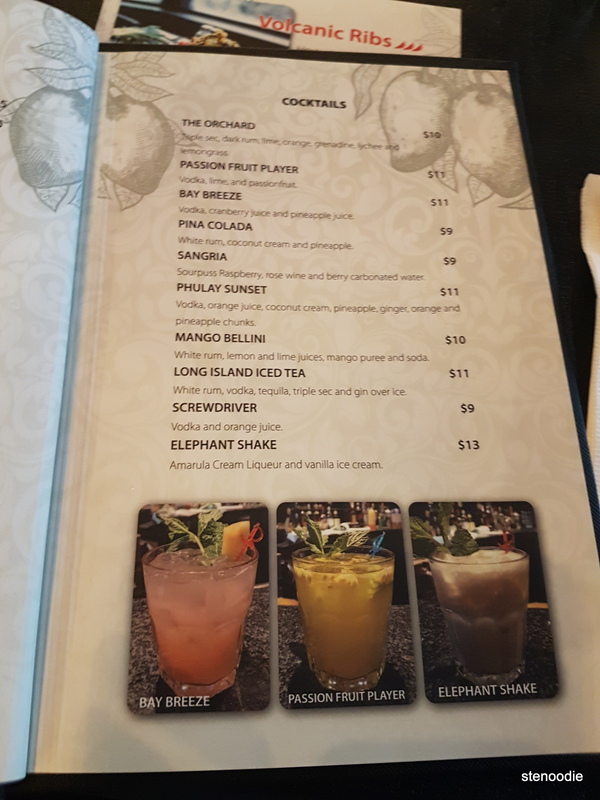 The menu itself featured various soups, salads, starters, curries, fried rice, main dishes, desserts, as well as a good selection of non-alcoholic and alcoholic drinks. 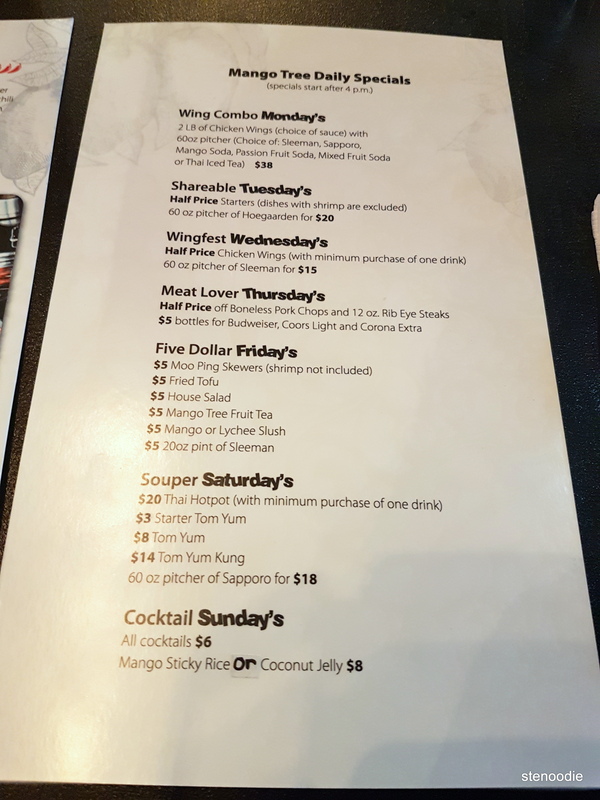 They also had specials for each day. 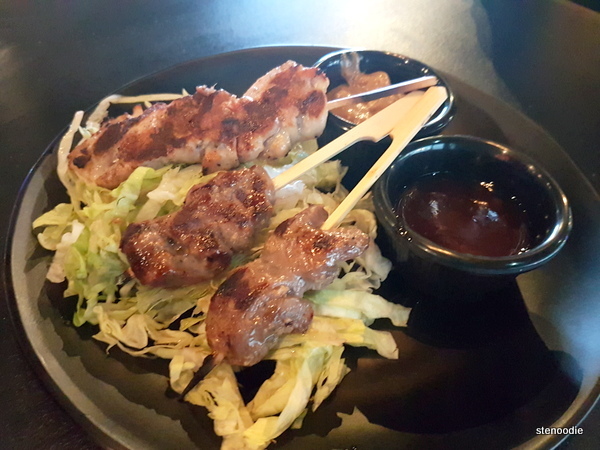 Since it was a Friday, we selected the $5 Moo Ping Skewers to share (it’s usually priced at $9). 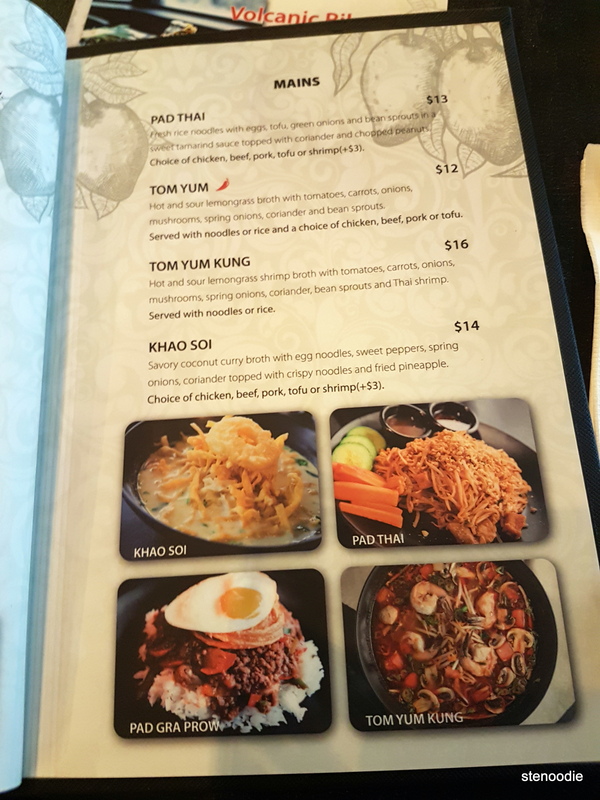 We also ordered the green curry with rice and beef as well as the Tom Yum with noodles and chicken. The bowl of Tom Yum soup with noodles was very large. This was a hot and sour lemongrass broth with tomatoes, carrots, onions, mushrooms, spring onions, coriander, and bean sprouts. 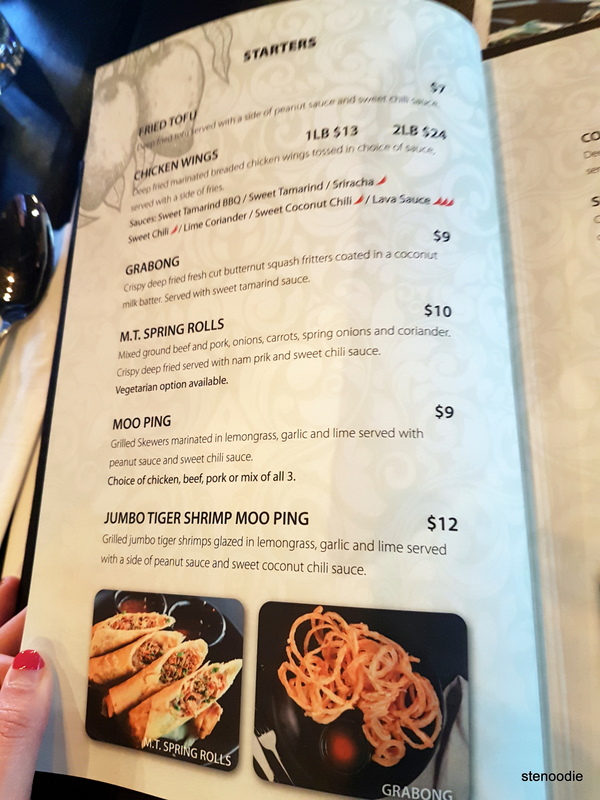 We picked the option of having noodles and chicken in it. We split this giant bowl of noodles between the three of us. I thought that even though we split it three-ways, the amount of noodles in the bowl was lacking. 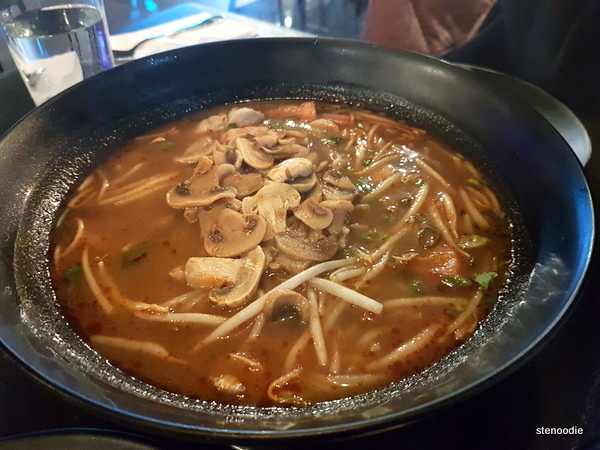 The broth itself was nice with a hot and sour taste, but the toppings and noodles were very mediocre. Lastly, the green curry with rice and beef arrived. 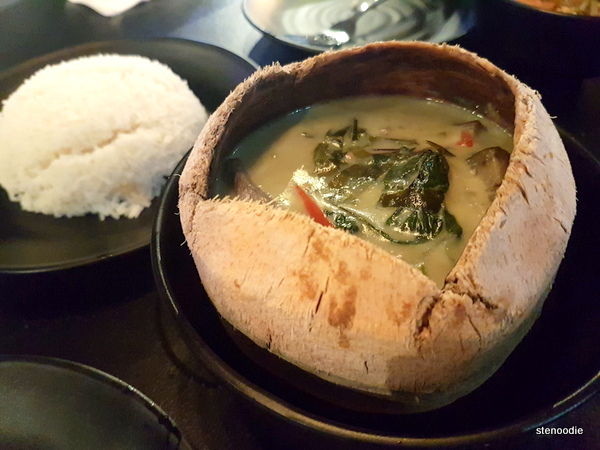 The green curry and beef were served inside of a coconut shell which made its presentation look very nice and authentic. 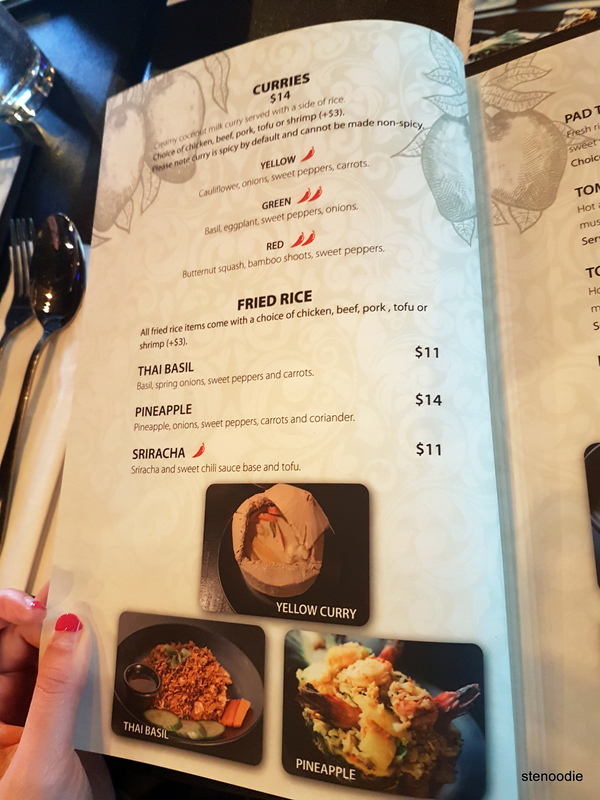 The white rice was served separately on a plate. Surprisingly, this was the best item of the night. 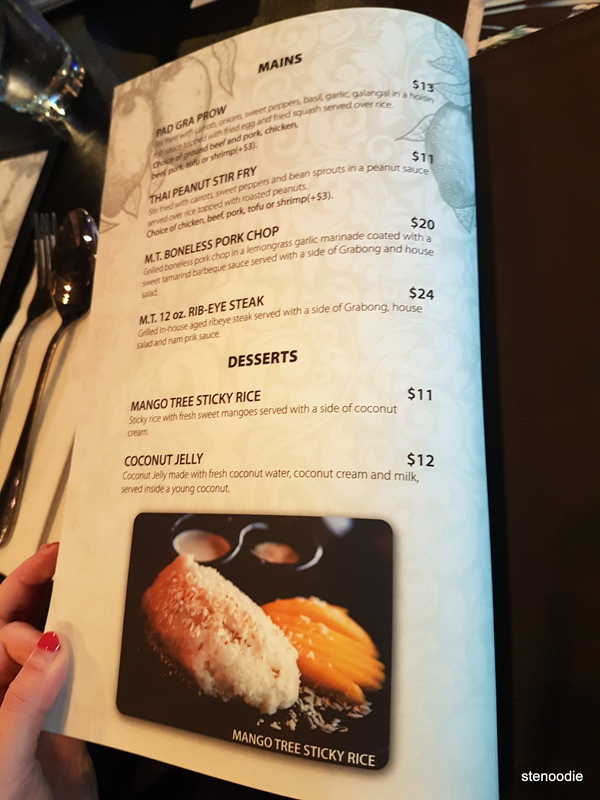 I thoroughly enjoyed the creamy coconut milk curry. The green curry (with basil, eggplant, sweet peppers, and onions) was not spicy. 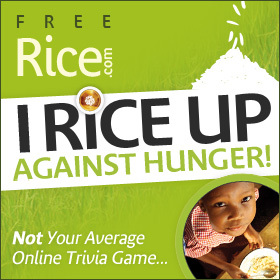 The rice also was very soft which helped to “soak” up the green curry to become a very “comfort food” kind of meal. 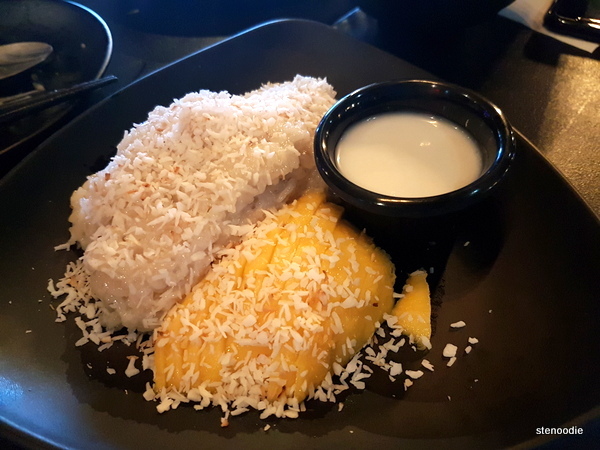 We ordered the Mango Tree Sticky Rice (sticky rice with mangoes served with a side of coconut cream) for dessert. This dessert took a while to come out and when we asked the server about it, it was only then that he informed us that it would take about 15 minutes to prepare. 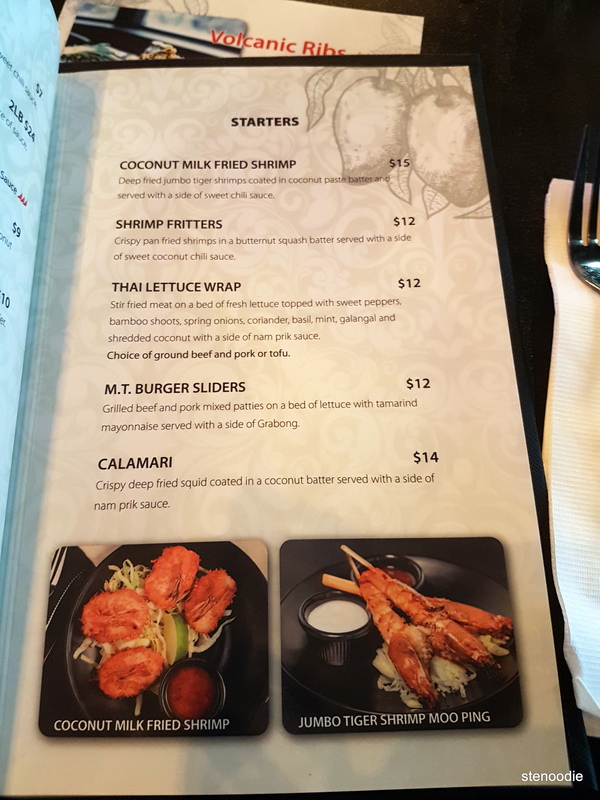 Nevertheless, the portion was pretty good for $11, but the taste and quality was so-so. Needless to say, the first impression of this restaurant is a rather confusing one. 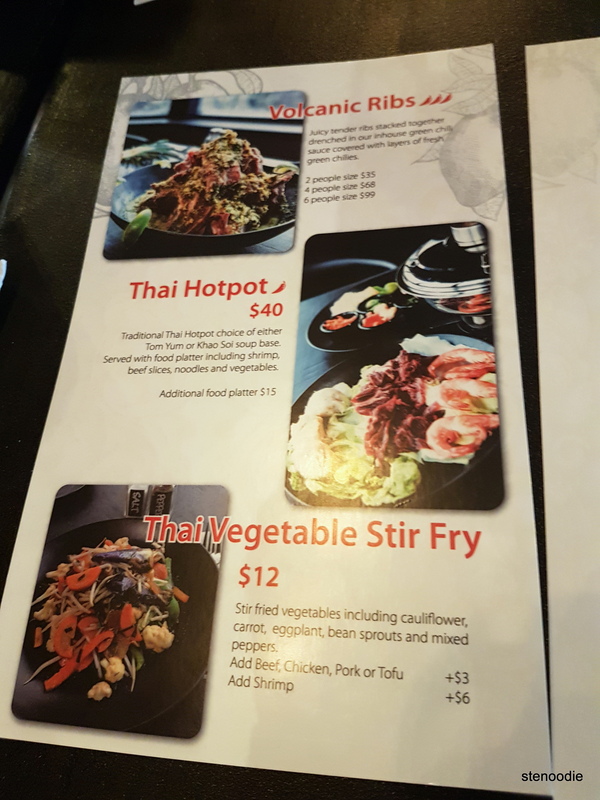 They are practically made to be a sports bar but they advertise themselves to be a Thai fusion restaurant, which doesn’t really mesh well. There were practically tumbleweeds rolling around during our stay and we wondered what their staying power was in this isolated area of Woodbine Avenue amidst today’s difficult restaurant scene. 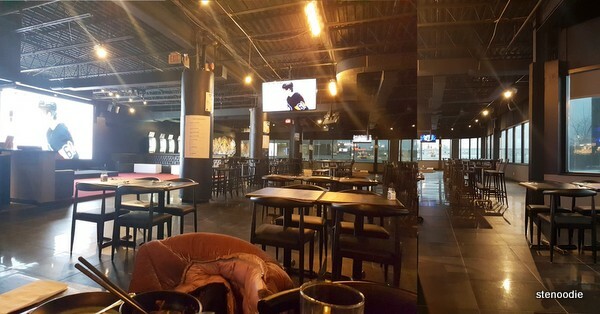 It is actually a great place to watch the game with a gigantic wall-to-ceiling TV screen. 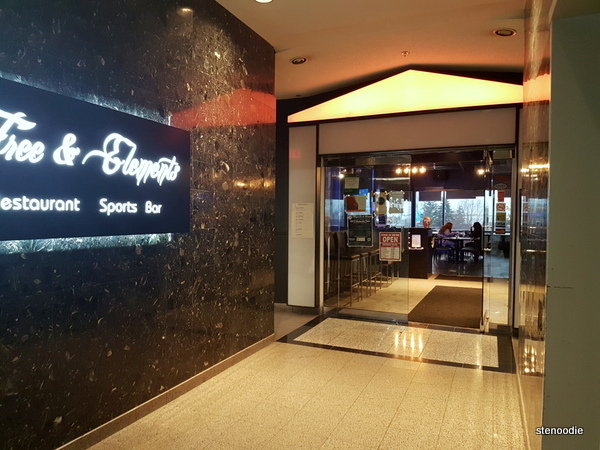 To better align themselves with a sports bar though (if they decide to go that route, and why not if they have the space and amenities for it), they should serve more sports bar food like wings by the dozen, nachos, chips, fries, and other various finger foods in addition to promoting themselves appropriately to draw in the right clientele. Also, an actual restaurant sign in the front of the building should be erected so that people know where the restaurant is. Has anyone been here on the weekends or late nights? Are they always this empty and devoid of customers? Is their lunch service more popular? 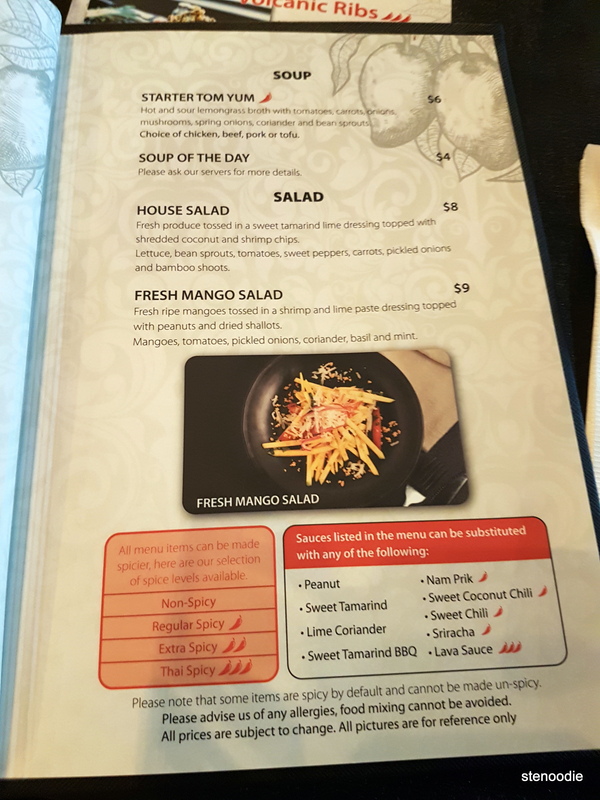 This entry was posted in Food and tagged 7850 Woodbine Ave Unit #228, 7850 Woodbine Ave Unit #228 second floor, Elements Sports Bar, food blog, foodie, green curry with rice and beef, Mango Tree Markham, Mango Tree Markham food reviews, Mango Tree Markham menu and prices, Mango Tree restaurant Markham, Mango Tree Sticky Rice, Mango Tree Thai Fusion Restaurant, Mango Tree Thai Fusion Restaurant menu and prices, Markham, Markham food bloggers, Moo Ping Skewers, restaurant review, Thai, Thai food in Markham, Tom Yum, Tom Yum noodle soup. Bookmark the permalink.